Mankind's first-ever probe of a comet found traces of organic molecules and a surface much harder than imagined, scientists said Tuesday of initial sample data from robot lab Philae. Philae fell asleep on comet 67P/Churyumov-Gerasimenko on Saturday, having run out of onboard battery power after 60 hours of prodding and probing an object zipping towards the Sun at 18 kilometres (11 miles per second). The lander control centre in Cologne, operated by German Aerospace Center (DLR), said Philae had uncovered much about the comet in spite of a rough touchdown in a less-than-perfect spot. "We are well on our way to achieving a greater understanding of comets," Ekkehard Kuhrt, project scientific director, said in a statement. "Their surface properties appear to be quite different than was previously thought." Philae landed on "67P" last Wednesday after a nail-biting seven-hour, 20-km descent from Rosetta, its orbiting mothership which had travelled more than a decade and 6.5 billion kilometres (four billion miles) to meet up with the comet in August this year. 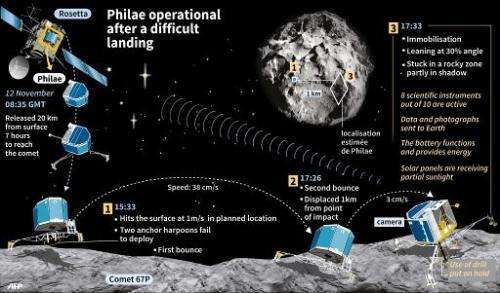 The touchdown 510 million kilometres (320 million miles) from Earth did not go entirely as planned, when Philae's duo of anchoring harpoons failed to deploy and it bounced twice before ending up in a crevice, its solar panels shadowed from battery-boosting sunlight. Among the most anticipated data from Philae had been chemical analysis of a drill sample which scientists hoped would shed light on the origins of the Solar System 4.6 billion years ago, and maybe even life on Earth. The DLR said the MUPUS probe, one of Philae's 10 onboard science instrument, hammered into the comet to discover it was "a tough nut to crack". "Although the power of the hammer was gradually increased, we were not able to go deep into the surface," said research team leader Tilman Spohn. Electric and acoustic experiments confirmed the comet was "not nearly as soft and fluffy as it was believed to be" underneath a surface layer of dust. Despite its imperfect footing, Philae managed to deploy a drill, but it was not clear whether any soil sample had been examined onboard. 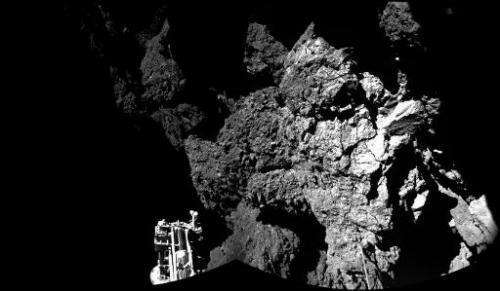 Yet the team said Philae's COSAC gas analyser managed to "'sniff' the atmosphere and detect the first organic molecules" shortly after landing. Some astrophysicists theorise that comets "seeded" our fledgling planet with the beginnings of life-giving water and organic molecules, and hoped that analysis of "67P" would prove this. "Analysis of the spectra and the identification of the molecules are continuing," said the statement. 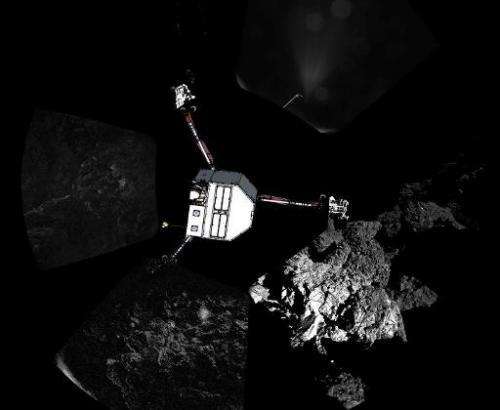 Project manager Stephan Ulamec said he was confident Philae would make contact later "and that we will be able to operate the instruments again", as the comet moves closer to the Sun. By spring of 2015 (about March-May in the northern hemisphere), it is hoped that Philae will communicate with its mothership and by summer "it might be possible that temperatures on the comet will allow Philae's battery to be recharged." Rosetta will continue orbiting the comet to receive any signals from Philae, if it were to wake up from hibernation. Thank you, Mando. Nothing annoys me more on this site than the tiny pics. This picture is 45k! It's 2014, we can handle a MB pic. As a rule, images should expand to at least full screen or larger. You do realise that you can ZOOM by holding control down, and using the wheel on your mouse?? Or hold control and press + or -. That way you can read the image fine. so why have a link called "enlarge" if it opens in same size? Now the nut jobs are claiming it isn't a comet after all but an alien space craft. That way you can read the image fine. But it's still blurry as heck. This is no CSI stuff.